Since I posted here last, two weeks ago, life has been crazy. I went to an amazing dinner for my brother’s cancer center where he got honored (I wish I had been able to document the food there! I think that might have been just a little tacky though, so I didn’t. ), I graduated (yay! ), I performed in and helped run a show with my old dance school (busy busy busy!) and I’ve moved almost everything into my new apartment. Not to mention making new friends, saying goodbye (but not forever) to old friends, and getting to know other friends better. Unfortunately, all of this does not make for very much time to make sushi, especially when my entire kitchen is in boxes. Thus begins a new chapter in my life. With such a big change in my life, I’ve got to celebrate with some awesome sushi, right? This recipe truly is amazing. The other day we got a mango from Son’s mom, and out of the blue I exclaimed, “Mango and tuna sushi… with Sriracha… wouldn’t that tast so good?” Son looked at me like I was a maniac of course, but just try it. You’ll see that I was right, in the same way that Son did when he tried this sushi. So. Good. Slice mango into paper-thin slices. 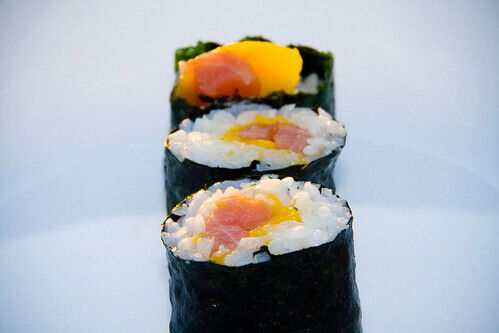 Roll the sushi, using some mango, tuna, and a little Sriracha sauce as your fillings. Damn, gotta try this when the mangoes are in season down under again. Looks good! This roll is delicious. I’ll bet you’ll love it. 🙂 So since you guys have opposite seasons from us, mangoes will be in season for you in about five or six months, right? Not sushi related but I realized that I had forgotten to congratulate you on the end of your schooling. Yay you!!! Did you move for a new job? Still trying to find sushi grade fish. Joel – Yeah, that makes sense. Yum! 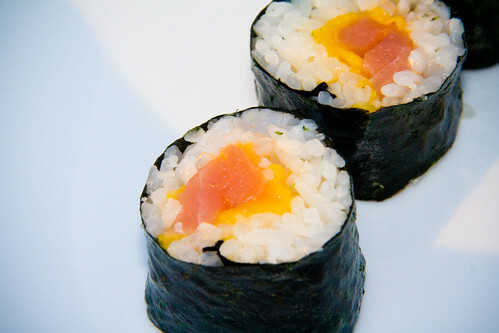 I had a mango hamachi roll once that was sooo good, so I know this is great! Thanks! This recipe was great idea starter for me! The idea of sweet maki was a great concept. Made a roll with mango as a starter added cream cheese, honey and fresh mint. Catered for a few art receptions and the crouds just went wild for them. This site has been great for ideas! Again, Thank You! Rachel – Mmm mango hamachi… yum! Josh – I’m glad you found inspiration from Sushi Day! That roll you made sounds delicious. Salmon and mango also makes a very good combination. 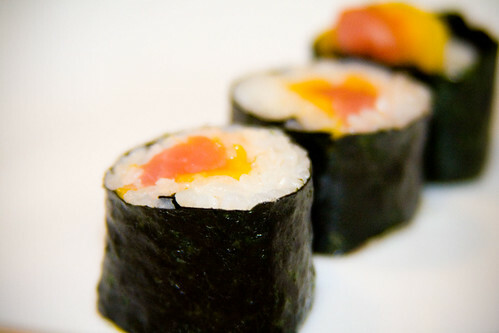 Your site is full of innovative sushi ideas, wish I’d found it sooner! Karina – Thanks so much. 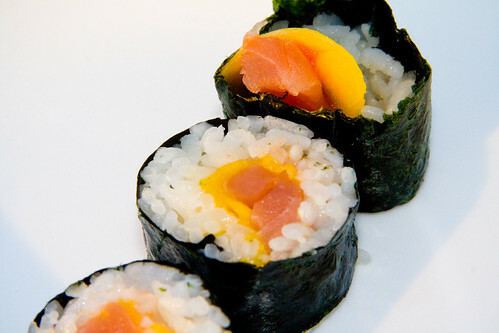 I’ve never had California Rolls with mango, but I can imagine those would be delicious! This reminds me of my favourite roll! It has shrimp, spicy mayonese and mango, sometimes spring onion. I bet I will like this one too! This sounds delicious. 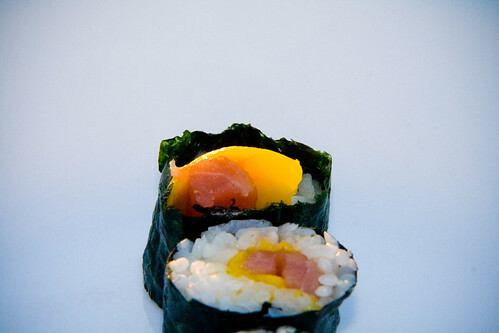 ^_^ It reminds me of one of my favorite combos: smoked salmon, mango and avocado. If you haven’t tried it already, I highly recommend it. Also, thank you so much for all these tasty, fun recipes. I only discovered this blog recently and I love reading it.